The Onondaga County War Memorial opened in September of 1951. Over its existence, it has hosted an NBA Championship team in the Syracuse Nationals. Entertainers from Elvis to Kiss to Disney on Ice have performed there. Its been home to various professional ice hockey, indoor lacrosse and indoor soccer teams over its 67 year history. And has been through upgrades and renovations but none more transforming then the latest one completed just this month. Montgomery Street Entrance to the Onondaga County War Memorial Arena with the new digital marquee in Syracuse, New York on Saturday, October 13, 2018. Nikon D750/16-35VR, 1/125s, f/8, ISO 400, EV +0.3, 16mm Focal Length, Skylum Intensify CK. New high definition digital scoreboard inside the Onondaga Country War Memorial Arena in Syracuse, New York on Saturday, October 13, 2018. Nikon D750/16-35VR, 1/125s, f/8, ISO 1800, EV 0, 16mm Focal Length. 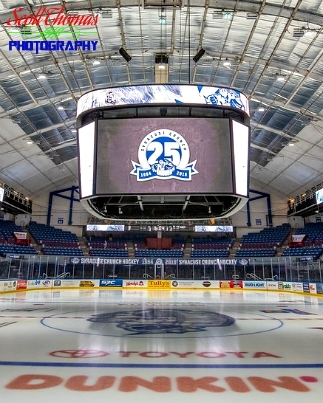 displays, renovation of all the bathrooms, construction of corporate suites and a VIP lounge, new arena lighting, ribbon lighting and, of most importance to the main tenant, the Syracuse Crunch Hockey Club, a new video scoreboard. The old scoreboard had been having issues including whole video panels malfunctioning for most of last season. The new scoreboard is completely digital so all panels can be used to enhance the game experience and allow for more and flexible sponsor advertising and give all spectators a great view of the game in full high definition resolution on panels twice as big as the old ones. The War Memorial staff have only had a couple of weeks with the entire system installed. As they get to learn all about its capabilities, the more enjoyment it will bring to the fans who come to games and other events. New suites in the Onondaga County War Memorial Arena in Syracuse, New York on Saturday, October 13, 2018. Nikon D750/16-35VR, 1/60s, f/8, ISO 5600, EV 0, 16mm Focal Length. competitive teams and keep the cost of arena tickets down for season ticket holders and fans who may only come to a few games a season. It was a major want of the Syracuse Crunch management staff to have them and the Legislature agreed. 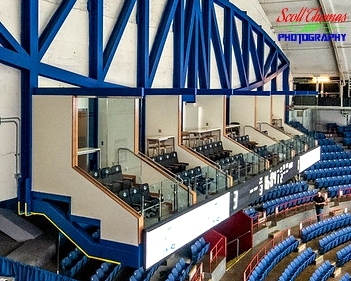 The north wall of the War Memorial Arena had six doorways installed leading out to the new suite seating areas. Behind each of the doors are kitchenette areas with a refrigerator, warming stove, cabinets, a couch, a table and chairs and a digital display showing the game so suite owners would not miss any of the action if they needed a beverage or a bite to eat. In keeping with the war memorial tradition, each suite is named for a U.S. military service branch. 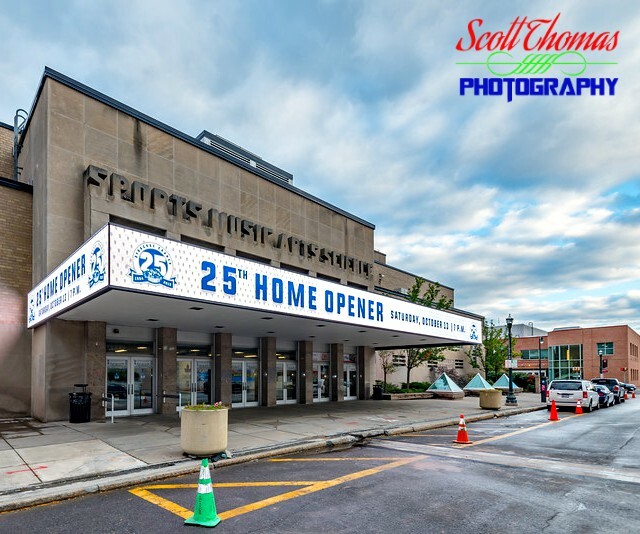 Opening Night for the 25th Anniversary season for the Syracuse Crunch American Hockey League (AHL) team at the Onondaga County War Memorial Arena in Syracuse, New York on Saturday, October 13, 2018. Nikon D750/16-35VR, 1/125s, f/8, ISO 400, EV +0.3, 16mm Focal Length, Skylum Intensify CK. It was also announced two days before Opening Night that the Syracuse Crunch had extended their lease for an additional six years (the link shows the arena before the upgrades) and will be calling Syracuse home, at least, through the 2029-2030 season. Ensuring the Crunch will be celebrating their 30th and 35th year inside the historic and now ready for the 21st Century War Memorial Arena. 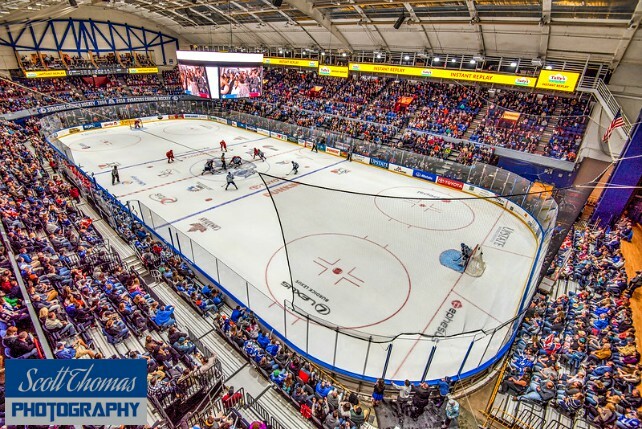 This entry was posted in Sports, Weekly View and tagged 16-35mm, ahl, american hockey league, arena, crunch, digital, fans, history, ice hockey, intensify ck, marquee, new york, nikon D750, onondaga county, ribbon lights, scoreboard, skylum, suites, syracuse, uwa, vr, war memorial, wide angle. Bookmark the permalink. Awesome renovations, awesome review! Thank you!